Blazer - J.Crew (runs big, on sale!) | Tank - Express (runs TTS, on sale!) | Leggings - Express (runs TTS, on sale!) | Shoes - Manolo Blahnik (amazing less expensive option on sale here) | Bag - Saint Laurent (similar here) | Earrings - Lisi Lerch | Lips - Tom Ford "Dylan"
I'm still in a food coma from my Thanksgiving meal, but I'm thankful so much of my shopping can be done online. LOL #sweatpantslife And if you are like me and doing most of your shopping online, hopefully this list and suggestions are helpful. Most of my favorite retailers are having great sales, and I pulled out some pieces not to miss from each one. But be sure to check out this post too which has ALL my recent outfits that are on sale! These joggers and this coat are two of the most popular selling items from that post already. Followed closely by these faux leather leggings. 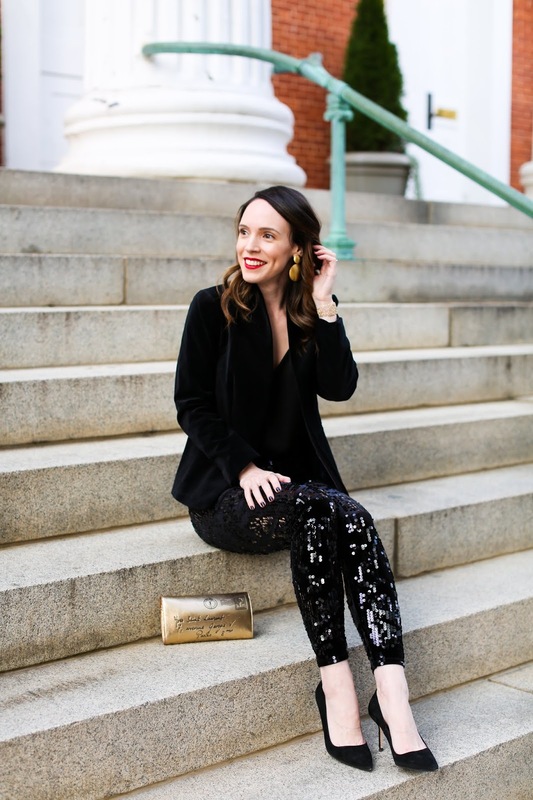 But before you begin scrolling through all the below deals, be sure to check out today's outfit post because how cute are these sequin leggings? And the velvet blazer is great for a ton of different holiday outfits. Both are on sale along with my camisole which I have in multiple colors because it's a great basic. Let me know what great stuff you end up getting from all the Black Friday deals!! Be sure to check the Holiday Shop to see all of the new additions! Net-a-porter - 50% off select items, tons of Sisley products on sale!! Urban Outfitters - Buy one, get one 50% off. Sites that currently have Golden Goose sneakers on sale - here and here! iRobot Roomba - this would be a dream! Nest anything! I want the doorbell or the thermostat. I've heard nothing but good things about this blender! If you are looking for a nice camera, this is the one we use for all my blog photos and love it (the lens we use is also on sale here)!